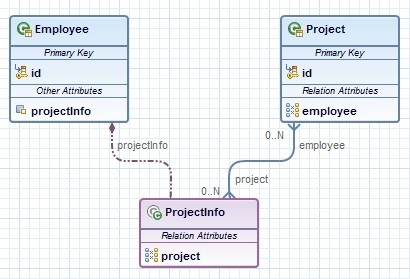 This page describes how the behavior and the visualization of the Embeddable classes and Mapped Superclasses must look in the JPA Diagram Editor. An entity may inherit from a superclass that provides persistent entity state and mapping information, but which is not itself an entity. 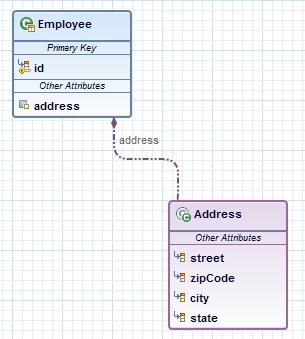 Typically, the purpose of such a mapped superclass is to define state and mapping information that is common to multiple entity classes. 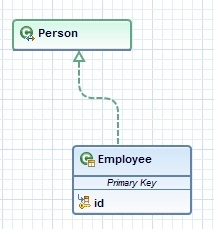 There shall be clear enough that the newly created entity will be the subclass of the mapped superclass, that's why the entity shall be connected to the mapped superclass with a dashed green arrow, indicating that this connection is of type "Is-A" relationship and differs from the other entity's specific relationship mappings available in the palette. Note: An entity can inherit another entity, so the Inherited Entity feature shall be available to be used for creation of a sublassed entity from another entity. 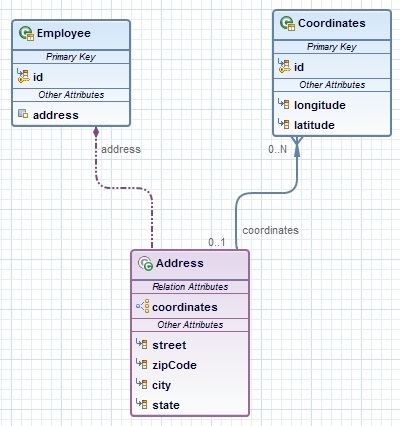 Relationships defined by a mapped superclass must be unidirectional with an owning side only. That means that only the unidirectional relationships from the palette shall be possible to be created and the direction of the relationships shall be from the mapped superclass to the entity. An entity may use other fine-grained classes to represent entity state. Instances of these classes, unlike entity instances, do not have persistent identity of their own. Instead, they exist only as part of the state of the entity to which they belong. An entity may have collections of embeddables as well as single-valued embeddable attributes. Embeddables may also be used as map keys and map values. 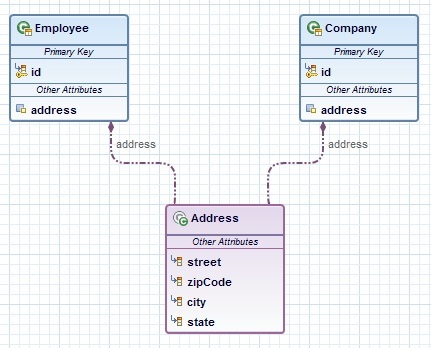 Embedded classes belong strictly to their owning entity, and are not sharable across persistent entities. In JPA 1.0 only Basic and Transient mapping were supported. 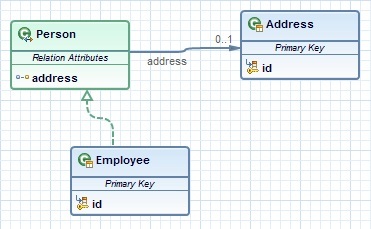 JPA 1.0 does not support nested embeddable classes and relationships from embeddable. Note: In case of JPA 1.0, there shall be section Composition, which shall contain only one palette entry Embed Single Object. 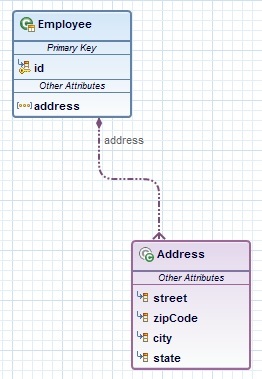 There shall be clear enough that the embeddable class is embedded in the entity, that's why the entity shall be connected to the embeddable class with a dash-dot-dotted violet arrow, indicating that the entity "has a reference" to the embeddable class and it differs from the "Is-A" relationship. Note: In JPA 2.0 Embeddable classes can be embedded into another embeddable class, so the "Embed Single Object" and "Embed Collection of Objects" features shall be available in this case too. Note: Element collections shall not contain embeddables with element collection mappings. Note: If the embeddable class is not embedded, the creation of unidirectional relationships shall not be possible. Note: If an embeddable is embedded as element-collection, only one-to-one and many-to-one relationships shall be allowed. Note: Relationships to embeddables shall not be allowed. Generally relationships shall be to the entity, in which the embeddable class is embedded, not to the embeddable itself. Note: If the embeddable class is not embedded, the creation of bidirectional relationships shall not be possible. This page was last modified 05:00, 19 October 2012 by Petya Sabeva.